There is rarely a week that goes by where we don’t have an order for a modular kitchen set; our customers just can’t get enough of them. We – like our clients - are also quite fond of our kitchen sets because they are not only fun, but they’re also great tools for developing your child’s cognitive development. If you’re one of the few people who hasn’t bought a modular kitchen set yet, this article might just convince you to get one. Enhances Motor Skills: Learning how to coordinate yourself and your limbs can be quite tricky when you’re small, and it takes a lot of practice to get good at it. Modular kitchens are great for developing hand-eye coordination and other motor skills as children will have to pick things up, place things down and put things away in order to play. Enriches Social Development: Perhaps one of the biggest hurdles of growing up lies in communication. It’s hard to get people to understand you, and it’s even harder to recognise emotions in other people. Playing together in a role play scenario helps children to develop these skills whilst having fun and being creative. Teaches Life Skills: Children learn by observing and copying, and when it comes to the kitchen, there is a lot to learn. A real kitchen is no place for a small child, but a modular kitchen allows them to understand cooking, cleaning and tidying in a safe and enjoyable way. Stretches the Imagination: As Albert Einstein once alluded to; being academically smart means nothing if you lack imagination. It is so important that we allow children to grow and develop artistically and creatively, and playing house or pretending to be a chef is a great way to do this. 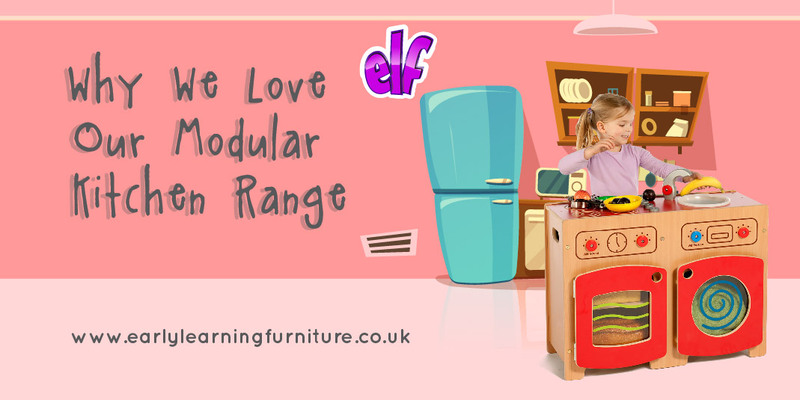 Here at Early Learning Furniture, we supply an extensive range of modular kitchens that have been crafted especially with little ones in mind. If you’re looking for a complete set, our Modular Kitchen range has several alternatives for you to choose from. These sets include microwaves, ovens, sinks and more and are a great way to make a home corner in your classroom or school. If you want to create your own kitchen area that is unique to your space, then our single unit The Wolds range is our more budget-conscious choice; but the lower price doesn’t mean it lacks any of the benefits of the other ranges. You can choose from a sink, a cooker, a washing machine, a fridge or a complete toddler kitchen. Our bestselling singular range is the Stamford range. Bright colours and intricate details make this a popular choice. You can select a microwave, a cooker, a washing machine, a fridge, a sink or a complete kitchen set. We are specialists in early years play and learning equipment. All of our modular kitchen sets are made in the UK and are backed with warranties to protect them against damage. Each set has rounded corners and anti-finger trap hinges to prevent accidents, and each kitchen is easy to clean and wipe. Made from strong wood, our sets will last you a lifetime and ensure that generations to come get to get to experience the benefits of modular kitchens and role play. For more information about our modular kitchen sets or any other imaginative play resources, contact us or call our friendly sales team on 01733 511121.